Steve Squyers maneuvers to an anchor point on "asteroid" rock wall during one of the extravehicular activities. Four aquanauts descended to an undersea research base off the Florida Keys Monday (June 11), kicking off a 12-day mission designed to help future spaceflyers explore near-Earth asteroids. The four adventurers entered the Aquarius research station — which sits 62 feet (19 meters) down in the ocean about 3.5 miles (5.6 kilometers) off Key Largo — at 12 p.m. EDT (1600 GMT) Monday, NASA officials said. The 16th expedition in the NASA Extreme Environment Mission Operations program, or NEEMO, has now officially begun. 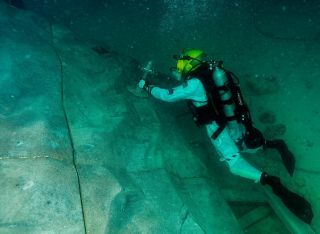 Because NEEMO missions put participants in a hostile, alien environment, they're good analogs for expeditions to asteroids, planets, moons or other space destinations, officials said. NEEMO aquanauts can simulate living on a spacecraft and test techniques for future space missions. NASA can also weigh down the participants to varying degrees, to simulate different gravity environments. "We're trying to look out into the future and understand how we'd operate on an asteroid," NASA astronaut Mike Gernhardt, NEEMO principal investigator, said in a statement. "You don't want to make a bunch of guesses about what you'll need and then get to the asteroid to find out it won't work the way you thought it would. NEEMO helps give us the information we need to make informed decisions now." NEEMO 16's undersea crew consists of astronaut Dottie M. Metcalf-Lindenburger, Japanese spaceflyer Kimiya Yui, European Space Agency astronaut Timothy Peake and Cornell University professor Steven Squyres, who is also the lead scientist for NASA's Spirit and Opportunity Mars rovers. The crewmembers' activities over the next 12 days will focus on three core areas — dealing with communication delays, figuring out optimum crew sizes and coming up with ways to attach to asteroids (and stay attached to a space vehicle during excursions). Metcalf-Lindenburger, Yui, Peake and Squyres will stay underwater for the duration of NEEMO 16, which concludes June 22. Aquarius is the world's only undersea research station, according to NASA officials. It sits on a sandy patch of seafloor next to coral reefs in the Florida Keys National Marine Sanctuary. Aquarius is owned by the U.S. National Oceanic and Atmospheric Administration and managed by the University of North Carolina at Wilmington. The 81-ton Aquarius measures 43 feet by 20 feet by 16.5 feet (13 by 6 by 5 meters). The research station has six bunks and many of the comforts of home, including a shower, a toilet, hot water, a microwave, a refrigerator, air conditioning and computers with a wireless link to shore.